I should do some sums and work out how much I have to make before the yoghurt maker pays for itself – actually I can’t be bothered, after all how do I cost the whey which I can use to bake bread? Can’t buy that anywhere locally..
No 1 with easi yo packet plus water to fill up jar ( a litre in all) – this one split into curds and whey. Why? Think it’s not supposed to be made in an electric yoghurt maker but in the easi yo kit. Made some fabulous whey and labneh from it all the same. No 2 with a litre of UHT full cream milk plus 2 spoons Marvel skimmed milk powder plus 2 teaspoons of live Yeo Valley yoghurt – perfect set but a bit bland. The easiest method as it doesn’t involve heating milk. Brian preferred the UHT and I preferred the almost organic one – don’t know if one can buy organic skimmed milk powder somewhere but I will look around. 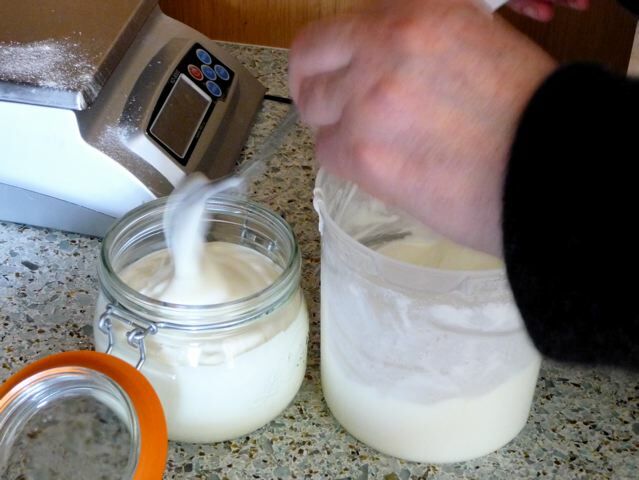 What I’ve learnt so far….yoghurt making is much easier than making bread…..
Do not use more than two teaspoons of starter yoghurt to a litre of milk, it’s very similar to leaven in that regard. Less is more. Do not mix it up too much, it doesn’t need it. Don’t joggle it about while it is setting, it likes to be left alone. To turn it into yoghurt cheese – labneh – rumoured to be lower in calories than cream cheese – line a sieve with muslin, and let the yoghurt drain through for a day in a cool place. I made little balls of cheese rolled in a mixture of zaartar, salt and pepper – sweet paprika – oregano to go with last night’s supper of salad, fried almonds, and Ottolenghi’s legume and noodle soup from The Guardian. Eaten for breakfast with honey and hazelnuts and a couple of slices of the legendary delicate milk loaf! What do you do with your yoghurt? This entry was posted in Dog Walks, Recipes, Yoghurt and tagged labneh, lakeland, Ottolenghi, UHT milk for yoghurt, Yeo Valley, yoghurt on 13/04/2010 by Joanna.